South Korea's intelligence agency believes that four of the North Korean men suspected of involvement in the death of Kim Jong-nam are spies. The older half-brother of North Korea's leader was poisoned at Kuala Lumpur airport, Malaysian police say. Four of the seven suspects named by Malaysia work for Pyongyang's ministry of state security, intelligence officials in Seoul told MPs. It is unclear which of the North Koreans wanted by Malaysia were meant. Mr Kim died two weeks ago after two women accosted him in a check-in hall at the airport. They say they thought they were taking part in a TV prank. 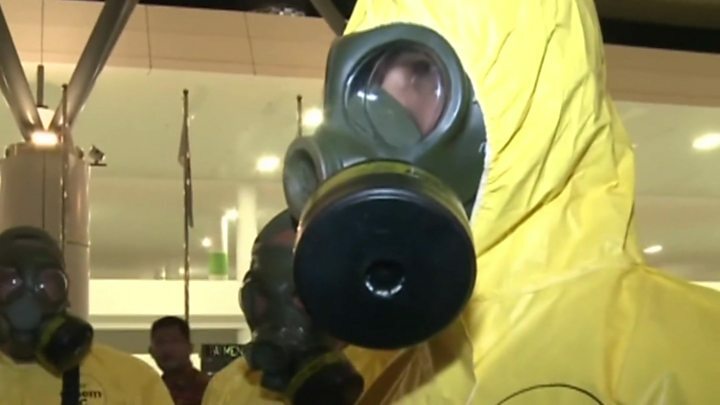 Mr Kim was given a very high amount of the toxic nerve agent VX and died in pain within 15-20 minutes, Malaysia's health minister said on Sunday. Who in North Korea could organise a VX murder? What is South Korea's take on the killing? Malaysian police arrested a North Korean man named Ri Jong Chol a few days after the killing. Six other North Korean men have been named as suspects or are wanted in connection with the death. Four of them flew out of Kuala Lumpur airport shortly after the attack on Mr Kim, returning to Pyongyang via a complicated route that avoided China. The two other North Koreans named by Malaysian authorities are a senior official at the North Korean embassy in Kuala Lumpur and an employee of the state airline, Air Koryo. While South Korea said on 19 February that it believed the North Korean regime was behind the death of Mr Kim, Malaysian authorities have not accused Pyongyang of carrying out the killing. North Korea has said that Malaysia is responsible for the death of one of its citizens and is attempting to politicise the return of his body. Kim Jong-nam: What is South Korea's take on the killing?